Having college dorm decor will let people know you've taken your dorm room and made it your own, leaving any chance of returning home behind! This is especially important for when when your sister comes to visit and report back to the family on how you're faring in this brave new world. Now, instead of telling everyone you're homesick and miss your mom, she'll say you're settled in and poised for success (but it's OK if the mom thing is still true)! For such a situation, there are no college decorations or dorm supplies that can make the immediate impact of a dorm rug. 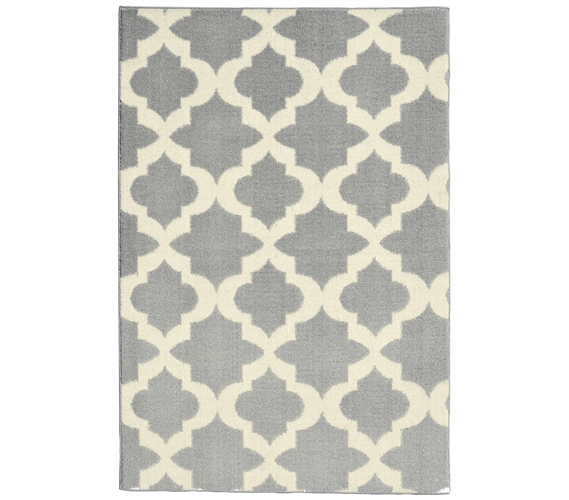 The Quatrefoil College Rug in Silver and Ivory is one such cheap dorm rug that will have your dorm room looking like home in no time. In silver and ivory, it is guaranteed to match your other college room decor and XL twin bedding, and will also add a comfy surface on which to walk. In a 5' x 7' it will also give your sister a place to sit or sleep, without you having to hear about the chill of the concrete floor. So do yourself, and your sister, a favor - buy a college rug. You'll be glad you did!